As many histories have pointed out, communities even under the best of conditions during this period were hit by diseases. People then simply had the perception that diseases appeared, even spread, and vague notions about how. Causes were offenses against God, witches, moist night air, imbalanced humors and eating too much fruit. Germ theory did not come until the 19th century (along with effective anesthetics). Beyond their grasp was any notion of disease vectors, like lice and fleas; the bodies of many harbored these nippy parasites. Basic concepts of sanitation and disease prevention eluded people, such as not having the latrine located close to the water source. It may not be a stretch to surmise that most cases of "camp fever" were indeed typhus, which is spread by lice, especially in filthy environments. While the onset of typhus may be so mild as to be shrugged off, "...the symptoms of malignant fever began to show themselves... a sort of internal disturbance became obvious, then prostration of the whole body, and a lassitude such as follows overexertion; the patient could only lie on his back, the head becomes heavy, the senses dulled, and in the majority of cases after the fourth or seventh day, the mind would wander... [and] red, or often purplish-red spots broke out on the arms, back and chest, looking like flea-bites..." so wrote the Veronese physician Girolamo Fracasoro in 1546. Soldiers stricken by typhus were obviously incapable of fighting. Soldiers back then considered two diseases to be outside the category of camp fever: bubonic plague and syphilis. It's an understatement to say the plague was well known and thoroughly feared at this time. Coming off ships at the port of Genoa in 1347, the plague burst across Europe like ignited gasoline. Radiating out from northern Italy, the plague jumped rapidly from area to area until it reached the periphery of Europe in 1351. Then it was as if it ricocheted back. Devastating flareups continued the remainder of that century, the worst being in the 1360's. By the New Year of 1400, the population of Europe was approximately half to two thirds of what it had been a century before (population loss was not only directly attributable to the disease but also to economic disruption and decline in the birth rate.) Although the population of Europe had recovered its numbers by the end of the 16th century, the plague remained the terror in the minds of all. Still around during this time period, erupting here and there as regional epidemics, it was not the big killer of soldiers and civilians during sieges. Certainly soldiers on the move carried the disease from one locality to another, but tales were not set down of entire armies or fortresses being wasted as cities were in the late 1340's. 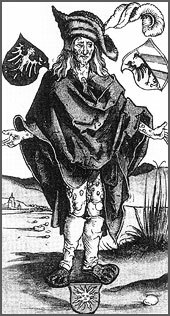 Soldier displaying the conspicuous symptom of syphilis: the boils, from which the disease derived its first name, the pox. Illustration by Albrecht Dürer, 1496. Now, in the early 21st century, bubonic plague is a rarity, but syphilis remains a worrisome problem.